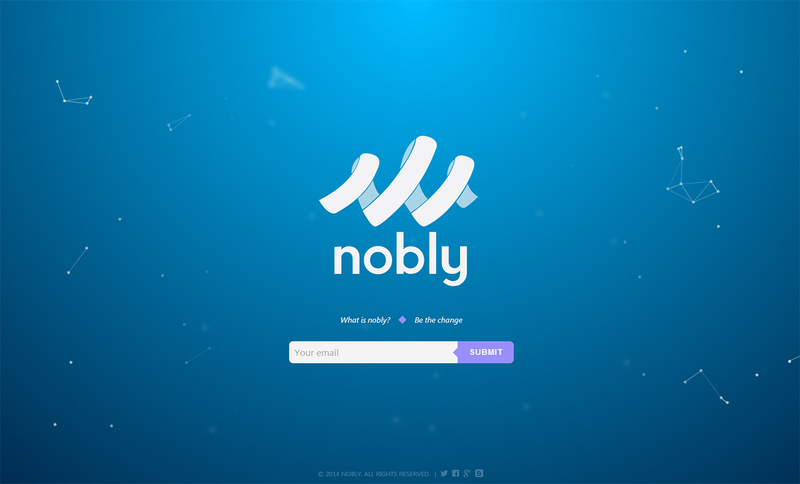 Responsive launching soon page with a moving particle background for upcoming startup, Nobly. Nobly is a place where people can connect with those in need, embrace their capacity for kindness, and track their altruism across timezones, cultures, and continents. Nobly features a fun and social means for finding ways to enrich the lives of those around you. Be it helping a friend move or being an ambassador for a charity, our network aims to showcase and connect the best parts of ourselves with the rest of the world. For this site, we hope to inspire users to sign up for our beta and be the first enjoy the nobly experience when we launch. The idea was to simulate the "create a chain reaction of kindness" concept with a particle system driven by a custom module written against HTML5 canvas. If you click the left link you should see several "dots" grow into larger, purple dots. Then if you click the link on the right "Be the change" you will see the other dots surround the purple ones. It's a bit abstract, but hopefully it provides some representation of our mission.